The day started out grey as kids gathered and parents said their see-you-laters. Once everyone had arrived, we started - as always - with intros and safety. We learned names, shared what flavor of ice cream we'd refuse to eat, and collectively discussed our community agreements for the day. Then it was on to drill technique and how to operate the chop saw safely. Robert does his ready call, making sure everyone around him is safe, protected and ready for the cut. This is Arson later in the day, prepping some wood for the bridge. Benjamin lines up the perfect cut. Ryan demonstrates excellent control over the speed of the cut. Next came the project announcement. At Project Ember, we always try to balance two key variables when picking a project. 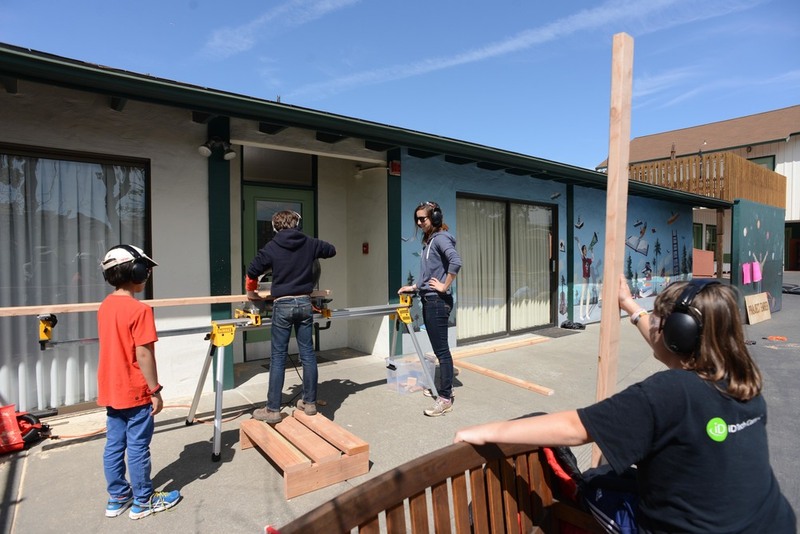 First, we make sure the project isn't too prescriptive, so the kids have room to creativity interpret the design. Then we set constraints to focus and give shape to the day. The prompt for this one day workshop: Bowling Ball Billiards. The constraints: we must be able to play from anywhere on our 12 by 16 tarp table without stepping onto the surface itself, and we've only got a small stack of lumber. Ideas started flowing instantly. Ryan envisioned a 16ft long pool cue with casters at the end to support its weight. Arson jumped in with ideas for a bridge (a tool used to play long shots on a pool table). Yiyou suggested we put casters on the bridge to easily move it around the table. Robert thought we could use goals as our pockets. Taj made sure we didn't overlook the need for bumpers around our table's edge. And Benjamin demonstrated excellent collaboration, building upon and finding ways to combine everyone’s thoughts into a unified vision. To make use of our limited time, we broke into teams. Katie and Yiyou got to work on the pockets while Ryan, Taj, Benjamin and Josh took up the challenge of the pool cue. Arson, Robert and Sammy decided that the bridge would be their challenge for the day. Yiyou gets started on the pocket and goal design. Arson and Robert get fixated on a bridge that is easy to position and therefore need wheels. They cleverly use pink tape as a depth setter so they don't drill through the wood and into the ground below. Taj, Benjamin and Ryan try a new placement for the wheels on the cue. Cue Team tests various positions for the casters. Robert takes the cue for a playful test run. Each team made progress at a different pace. After a few revisions, a tip from Josh about sistering 2x4s, and some adjustments on the placement of the casters, the Pool Cue team made quick work of their part of the project. The Bridge Team took a little longer. Committed to using casters on something which also needed to be static, they had to change course several times. 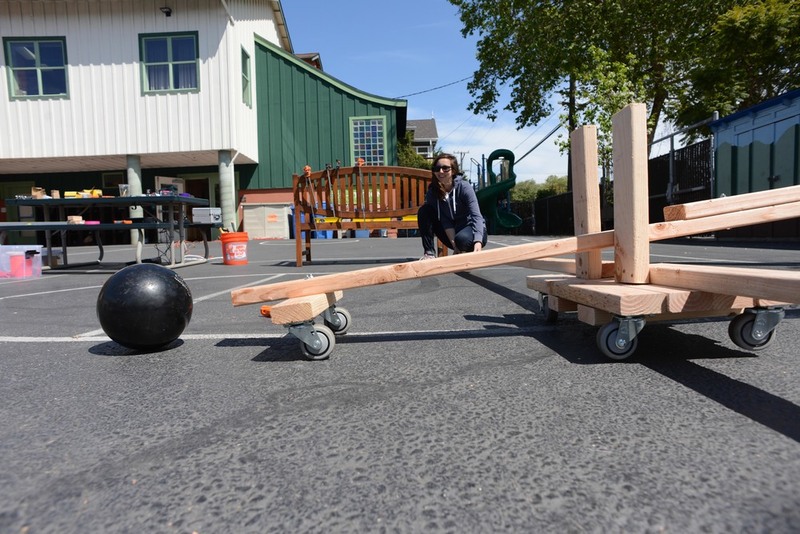 They settled on a cart with huge 8ft handles that allowed it to be manipulated from both sides of the board. The design required the kids operating the bridge to sit on the long handles to hold it steady while someone took a shot. After figuring how how to make it roll, then figuring out how to control the rolling bridge, Bridge Team and Pool Cue team came together to solve the problem of how the two objects interact. Arson, Sammy and Robert set up a slot for the cue to go between. The team goes on to add triangular gussets to stabilize their slot. And Arson gets particularly fixated with paracord and making our bridge look more like a bridge. All the while, Pocket Team made steady progress. They make an on-the-fly modification to their original box design. Halfway through the first model, they realize dropping the top arm will make a super strong triangle. The innovation saves time as well as two full sticks of lumber, which would go on to be the difference between being able to make bumpers or not at the final stage of the project. ...and spends the rest of the day making the pockets with laser focus. Throughout the day, the kids let their enthusiasm guide their work. Some stuck to one project from start to finish. Others felt they were most useful helping every team. Taj was a great cross team helper and gained confidence with the tools throughout the day. During the initial training, he opted not to try the chop saw, and began his day drilling with the Cue Team. He would later go on to become a deep student of the chop saw, making cuts for every team and learning how to miter the saw to make angled cuts. Eventually he made nearly every cut to create and connect our bumpers and walls. Taj makes another controlled and precise cut on the chop saw. Hitting the mark every time. Making a 45 degree miter cut. By the end, it was all hands on deck to finish the bumpers. Each goal needed to be connected and each span needed to be sistered to stand up to the force of rolling bowling ball. Cue Team, Bridge Team and Pocket Team join forces as the day closes. Cue team replicates Yiyou's design. Parachord gives the pockets a nice look and makes a soft landing for the ball. With 10 minutes to spare, the group finished. We celebrated by playing some pool, of course. Each kid took a go, and we set up harder and harder shots as we grew more comfortable with the cue and the bridge. Even parents had a go trying to sink the 1 and then the 8 ball. Practice shots from earlier in the day. Benjamin meticulously lines one up. Parents get in on the action. Linda makes the shot, but our slanted table and gravity conspire to cause a cue ball scratch a few moments later. After lots of problem solving, a bunch of scrappy solutions to supply constraints, and a fun final play test, we called it a day. Thanks again to all the kids for the effort and creativity and to the families for staying a little late so we could keep playing! And thanks to our wonderful host, Black Pine Circle. We're more excited than ever to spend the summer building here!